Arctic Snow sublimation physics is very hard to evaluate, but happens to be another very important reason why snow creates deeper cooling. Looks of 40 to 50 cm snow carpet, near record thickness, at the South shore of Cornwallis Island Nunavut Canada. 4 or 5 days of moderate at times heavy winds appear to have hardened the snow skin rather than distribute it evenly. The process is more complex than that, as this picture suggests, there is very thin ice over the entire canopy causing a direct reflection of wherever the sun is, the ice really forms heavily on the thinner snow cover, where sublimation is stronger, but here it is not so obvious. This polished veneer disappears in a few days suggesting it was a very dense crystalline cover. Same day. 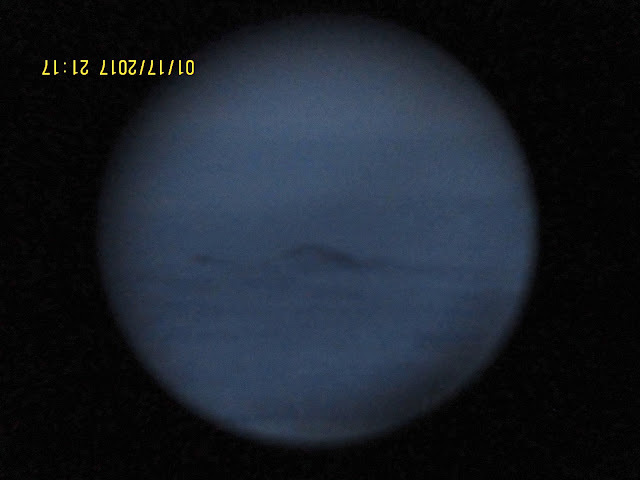 in the dimmer lower direct sun, there is no reflection on the same slope because the light is less strong, scattering is spreading out photons more thoroughly throughout a thicker atmosphere, where at first glance, ice appears to have formed, it is again more complex, a closer look reveals a denser top snow crust or skin. Likely 50 to 60 % hard top, a mix of very fine but compacted crystals, or a rough precursor to ice. What happened was intense venting of water vapor by the sublimation process, the winds caused a vacuum amongst the porous cover which accelerated the vaporization process. When so, top of skin hardens, column of snow slightly shrinks causing more sublimation vapor pressure, a natural version of a cold pressure cooker. 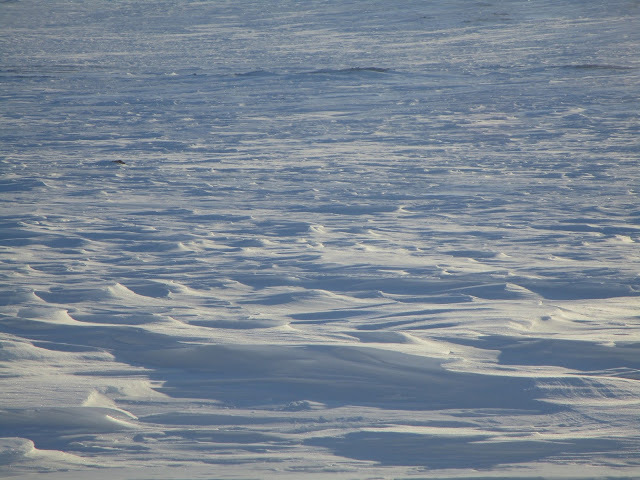 Days of Winds carving the thick snow canopy made for a chaotic surface, imaging the process which created it. There can be several layers of snow crusts in one column, each crust can be 500 to 600 kg/m3 dense as opposed to the entire column being 400 kg/m3. 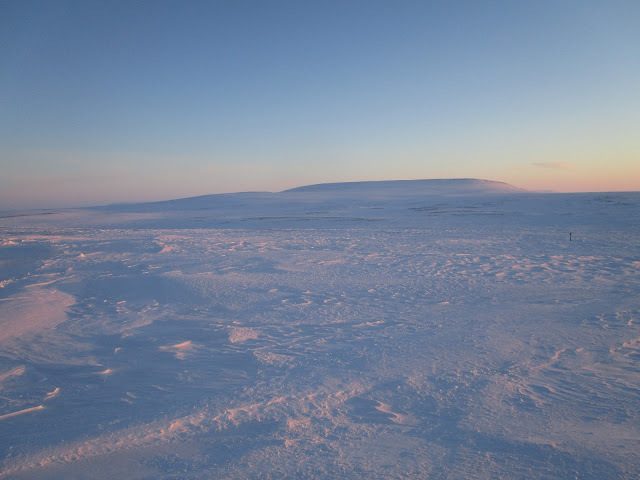 Within this top denser crust, the snow temperature was always colder than standard 2 meter air because of sublimation, this so happens as as long as there is a snow cover until the sun really is high in the sky. The solid small snow crystals to water vapor process requires a great deal of energy to happen, this energy is detected by the temperature drop within or on top of the skin and by conduction on the air immediately above it. Unfortunately, sublimation can only be measured accurately with lab conditions, the Arctic outside is loaded with varying weather, making sublimation appear different with each possible weather scene, when in fact it is rather a continuous process. 3013 (latent heat of sublimation) w/gr X 5000 gr = 15.1 million Watts to sublimate it. A typical 74.5 degrees latitude North High Arctic day top 1 cm snow may absorbs about 2.84 MWatts per meter square. Therefore it would take 5.3 days for the top cm to evaporate by direct sun radiation alone, which has been observed as such, but sublimation heat comes from potentially many other sources, from the warmer snow, the warmer air, back scatter from clouds, heat from ground or sea ice, by winds drawing out the heat within the snow or ground column. It is also very difficult to measure temperature at the surface to air interface due to UV affecting thermistors (coming essay). To maintain a loss of temperature of 1 degrees C within the same top 1 cm of dense crystalline snow, 10,000 watts per square meter would be required, this is clearly not happening. 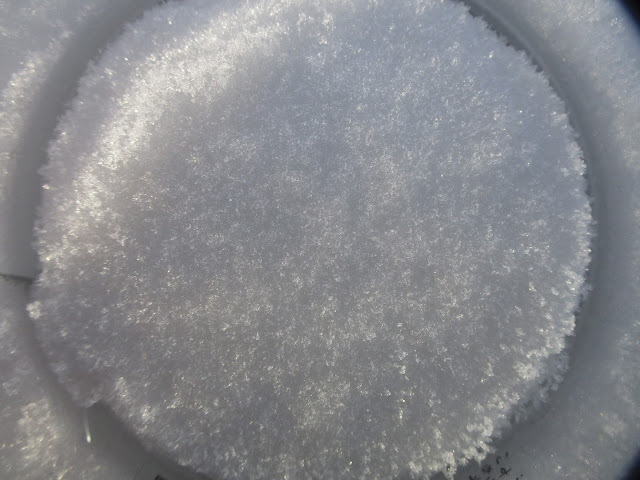 I have observed more like a permanent cooling of .1 to .3 C of the air immediately off top of thick snow column, this means the thickness of snow absorbing heat, rather sublimating, is very shallow, vaporization is actually happening in more like terms smaller than a millimeter, like the shrinking size of the crystals themselves with their micro-surface and total entity vaporize, if we consider 1 mm surface, meaning 500 grams per square meter, it would still take about 90 watts per meter square of energy to drop the surface temperature by 0.1 C. This is what is likely more realistic. 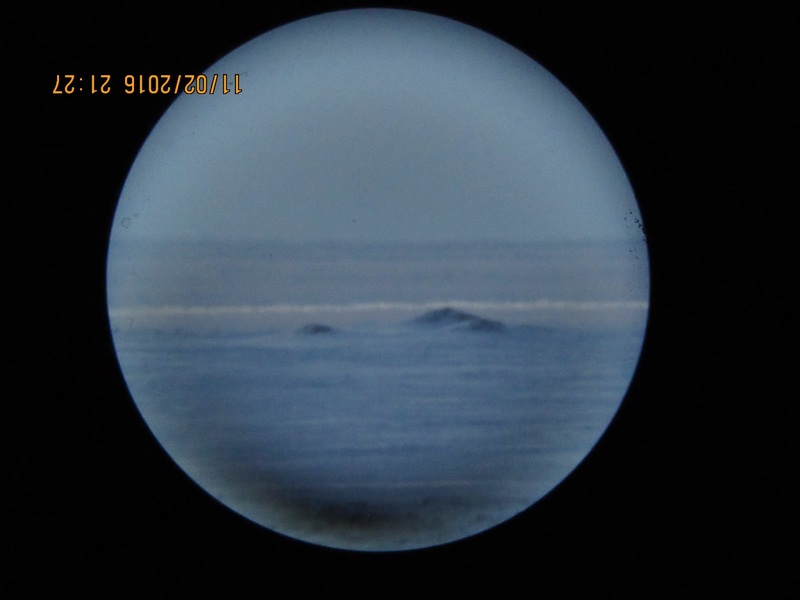 High Arctic November 2, 2017, Northwest Passage pretty much completely frozen, from this moment onwards the sea ice horizon will never lower below Astronomical Horizon. Here 2.6 Arc minutes above A.H. . It is counter intuitive, after all sea ice is less than 30 cm thick, a lot of heat is escaping from the sea despite the ice shallow sheet. But there is the process of snow and ice sublimation, which cools the solid top colder than the air right above, this creates a near permanent inversion causing the horizon to rise. at least 1.6 arc minutes above A.H, nearly 2 dark months have passed, the ice is 70 cm thicker than in November picture above this one. Less radiation escaped to space because of sea ice insulation properties. Throughout all dark season observations, not one was at or below A.H., all were above. Indicating a permanent colder top of sea ice than surface air. This is easier to explain, there is a colder sea ice layer always maintaining a colder top part, but that is not always theoretically possible. Sometimes cold air advection should overtake a warmer thermal ice imprint, making surface air colder than top of snow would lower the sea ice horizon below A.H. , this was never observed. Another reason to posit that snow sublimation always helps maintain an inversion at the interface between ice and air. NOAA HRPT latest visual animation Mainly April 5, 2017. Beaufort sea water arises from a short winter slumber, with sea ice measured quite new, about 1 meter thick, something easily manipulatable by clockwise winds from a small 1030 mb High pressure system. ~A great deal of energy is necessary to sublimate snow to water vapor. ~This energy likely creates a shallow cooling layer on top of snow surface, a potential component of air inversions. ~ The process is continuous as long as there is snow, helps explain the 1st rule of sea ice horizon refraction. Refer to graphs on page 89. Where boreal forest top of ground snow or air slightly above it was always colder than surface air. Although they did not highlight this feature in this paper, this confirms what happens in the Arctic as well. A boreal forest heavily snow clad horizon should be quite similar to sea ice horizons. Remains to identify the reason or reasons. What creates a skin surface to be colder than either air or what is below a skin surface? It is counter intuitive, but sublimation seems to fit the bill, it happens as long as there is snow, when so there would be an endothermic process involved, which infers a drop in temperature. A 5X closer look, March 31 2017 top of Arctic snow, easily capable of carrying the weight of a person with very little sinking, the top layer can be as dense as 40 to 60%, implying the presence of ice. At first mid afternoon top of snow appears dense , a few hours of sun seems to spring up vertically elongated snow rods. The mobile viewing apparatus sank more at the third picture without weight pressure applied, suggesting and expansion of spacing between the grains -as seen here - likely in part caused by more water vapor. Eventually the lower sun rays appeared to influence the return of snowflakes closer together. Throughout the modestly March 31 windy day (10-14 knots), surface temperatures in blue, measured by ventilated high precision thermistor, were always warmer than top of snow skin subdermal (in brown, equally measured by high precision thermistor). Just below snow skin was even colder snow, at least on this day, being more a function of permeation, or the basic long lasting surface air temperature imprint which varies day by day, 24 hours before surface air had much colder temperatures. Heat was transferred to the top of snow mainly from the warmer air and from solar radiation fueling the vaporization of snow to water vapor. During no winds clear March 24 afternoon, the surface temperature difference vs snow skin subdermal was far greater, by 2 C, this suggests the best way to measure sublimation is when there is no air turbulence, when thermal mixing is much reduced, allowing for top of snow thermal stratification to be enhanced. If there was another reason for colder snow skin, this matter would have been brought out by differing weather conditions, if there is an esoteric radiative cooling effect, independent of winds, we would have a similar subdermal skin cooling, windy or not. Optical observations also confirm lesser horizon elevation boosts when it is very windy. 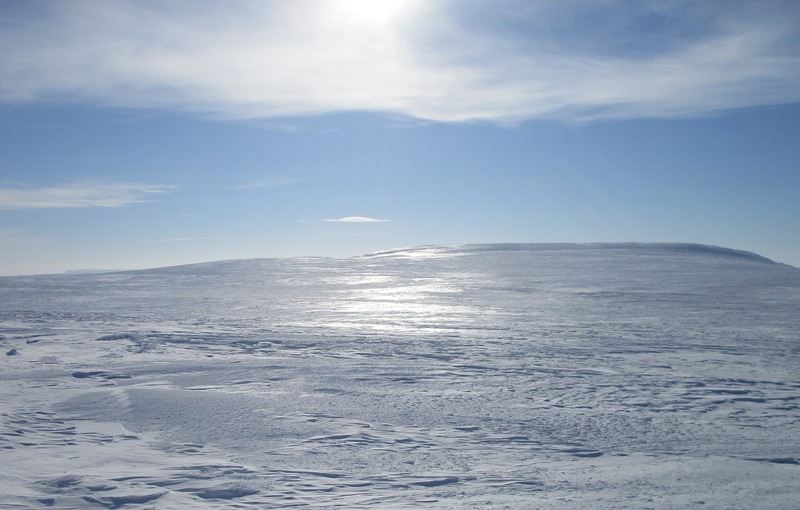 Applied on the totally white snow covered Arctic scale, the primary reasons for persistent winter inversions may be caused by the colder ground or sea ice with radiation escaping to space twinned with the sublimation of snow which is a continuous process until the sun is high enough in the sky to warm up top of snow surface, in spite of continuing sublimation, the extra heat compensates and appears to cancel sublimation cooling, triggering an even greater loss of snow cover without outside temperatures being well above 0 C. Since the end of 2017 long night, the Northwest Passage by Cornwallis Island had often a great deal of diurnal ice fog bursts, which may be explained by the presence of significantly above normal snow cover generating more water vapor, sublimating vapor adds to Arctic air bromine chemical mix always capped at the near permanent inversion peak temperature usually varying at about 800 meters in late March early April. A way to separate a possible thermal radiance cooling effect from sublimation would be to remove a portion of the snow column with a body warm enough to affect the snow skin temperature immediately above. I used a 9.3 liter sealed container having a liquid, mainly consisting water, made a cavity once filled with snow, placing the sealed container with +27.7 C liquid within, cover the exposed side of container with snow and measure subdernal skin temperature above an undisturbed 10 cm layer of snow separating the skin and top of container. A few meters away from this experiment, there was the regular high precision thermistor subdermal measurement which regularly showed a +.4 C skin cooling vs surface air, lower than measurements made March 24 and 31, because it was very windy, high winds above 10 m/s removed all chances of extensive stratification. 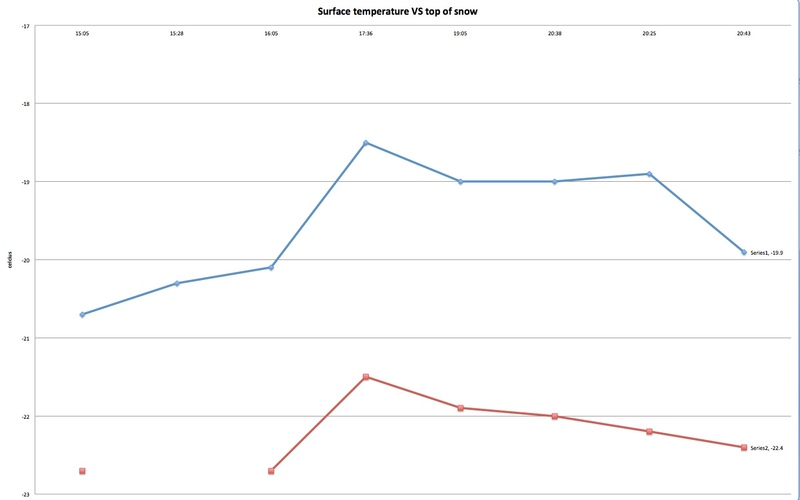 The subdermal temperatures above the container were always equal or slightly warmer than surface air, the opposite result above a complete snow column. This implies a warmed top snow layer without a skin cooling effect. Snow sublimation was highly likely occurring but the heat supplied by the liquid container overwhelmed the drop in temperature required to vaporize snow, similarly to when the sun is high enough and masks sublimation cooling.